My husband loves blueberry pancakes. If we are out to breakfast, chances are good that blueberry pancakes will be part of his order. If we are making pancakes at home, his pancakes would be blueberry (the kids prefer chocolate chip). We have tried several recipes through the years and now have a couple of favorites that we consider our “standard” pancake recipes. But I’m always interested in trying new ones. This one looked particularly interesting because of the streusel topping. Streusel topping makes everything better, right? Then I saw that the recipe came from our favorite breakfast place in Colorado, Snooze Eatery, and I knew I had to make it. I was not disappointed. Fluffy pancakes dotted with juicy blueberries are a great starting point. But the streusel topping with its hint of cinnamon flavor and light crunch takes things to a whole new level. These blueberry streusel pancakes definitely got my husband’s seal of approval. Did I mention there was also some blueberry syrup involved? Of course, some good ol’ maple syrup will be just fine on these pancakes. However, if you want to go all the way (and you do), make the blueberry syrup. You just pureé fresh blueberries with some syrup in a blender and then pour the mixture through a strainer to remove the blueberry skins. You can skip the straining step if you want to keep the blueberry pieces in the syrup. I preferred the syrup without them. Here’s a small life lesson illustrated in the photos above. I hesitated when I was pouring the syrup for the photo on the left and ended up dribbling the syrup down the side of the pitcher and making a mess. So, I tried again and just went for it in the photo on the right. The results were much better. Sometimes in life, you just have to go for it. 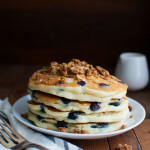 So, go big at breakfast this weekend – pancakes, streusel topping, blueberry syrup. Do it all. Don’t hold back. Purée syrup and blueberries in a blender until smooth. Strain syrup through a fine mesh strainer to remove blueberry skins. Set aside. Preheat oven to 350 degrees. In a small bowl, combine oats, flour, and brown sugar. Drizzle in butter and toss to coat. Pour oat mixture on to a small rimmed baking sheet. Bake, stirring occasionally, until golden brown, 15-20 minutes. Let cool. Heat a large nonstick skillet over medium heat and lightly coat with oil or butter. Working in batches, pour 1/4 cupfuls of batter into skillet and top each with 2 tablespoons blueberries. Cook pancakes until bottoms are golden brown and bubbles form on top, about 3 minutes. Flip and cook until golden brown and cooked through, about 2 minutes longer. Serve pancakes topped with syrup and streusel. Streusel can be made up to one week ahead. Store in an airtight container at room temperature. Don’t over bake the streusel waiting for it to become crispy. Bake the streusel until it is golden brown. It will crisp up once it cools. Recipe adapted from Bon Appétit, August 2013. Hi, how many pancakes does this recipe make? Just the four? This recipe will make about 6 four-inch pancakes. Thanks!